This article is the 10th part of the tutorial series called Node Hero - in these chapters, you can learn how to get started with Node.js and deliver software products using it. In this tutorial, you are going to learn debugging your Node.js applications using the debug module, the built-in Node debugger and Chrome's developer tools. 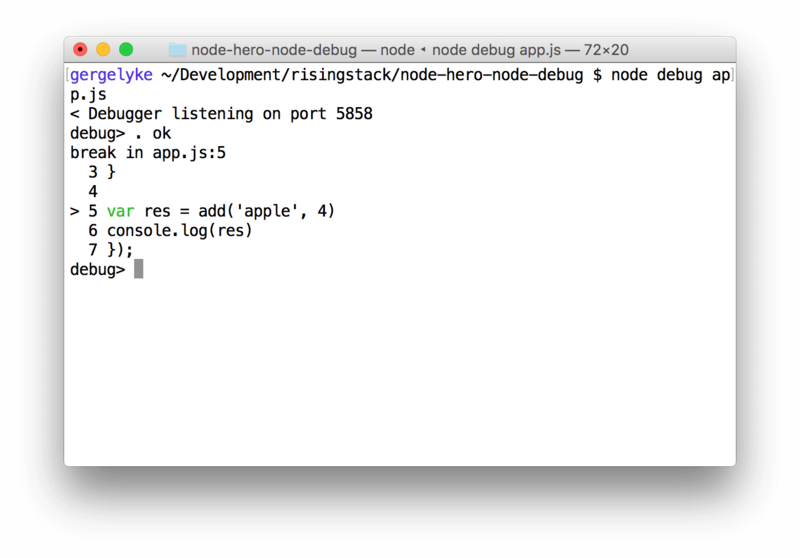 One of the most frequently used approach to find issues in Node.js applications is the heavy usage of console.log for debugging. Let's take a look at them! Some of the most popular modules that you can require into your project come with the debug module. With this module, you can enable third-party modules to log to the standard output, stdout. To check whether a module is using it, take a look at the package.json file's dependency section. To use the debug module, you have to set the DEBUG environment variable when starting your applications. You can also use the * character to wildcard names. The following line will print all the express related logs to the standard output. 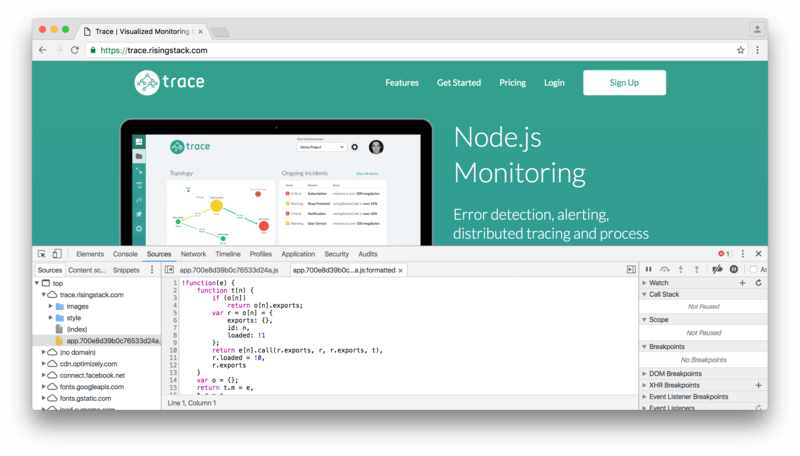 Node.js includes a full-featured out-of-process debugging utility accessible via a simple TCP-based protocol and built-in debugging client. You can add breakpoints to your applications by inserting the debugger statement into your codebase. It is possible to watch expression and variable values during debugging. On every breakpoint, each expression from the watchers list will be evaluated in the current context and displayed immediately before the breakpoint's source code listing. To get a list of active watchers type watchers, to unwatch an expression use unwatch('expression'). 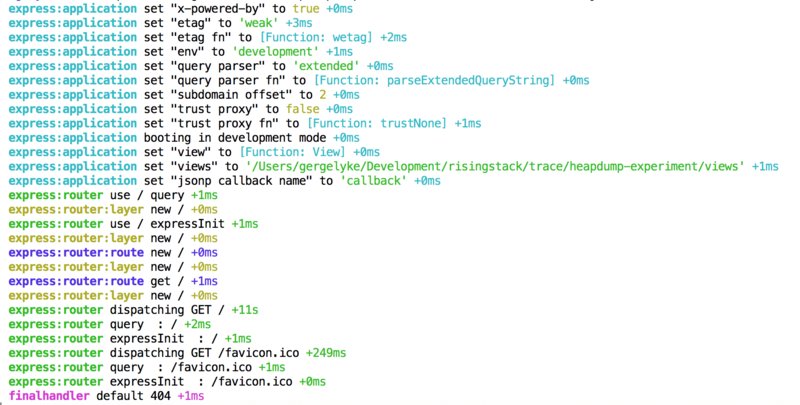 Pro tip: you can switch running Node.js processes into debug mode by sending the SIGUSR1 command to them. After that you can connect the debugger with node debug -p <pid>. To understand the full capabilities of the built-in debugger, check out the official API docs: https://nodejs.org/api/debugger.html. When you start debugging complex applications, something visual can help. Wouldn’t be great to use the familiar UI of the Chrome DevTools for debugging Node.js applications as well? Good news, the Chrome debug protocol is already ported into a Node.js module and can be used to debug Node.js applications. It will open up the Chrome Developer tools and you can start to debug your Node.js applications with it. Debugging is not that hard after all, is it? In the next chapter of Node Hero, you are going to learn how to secure your Node.js applications.